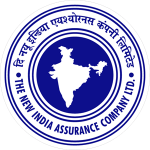 NIACL AO Mains Syllabus PDF Download- All candidates who have successfully applied for the New India Assurance Administrative Officer Recruitment would now be looking for the syllabus of the same. If you are one of those, ensure that you go through the entire article and download the NIACL AO Syllabus for Mains along with the Exam Pattern. The NIACL Mains exam will consist of an objective as well as a descriptive test. The division of marks are given in the following sections. Both of the tests will be online examinations. Please also note that the portion for the Generalists will differ from that of the Specialists. In addition to this, we have also given in the following sections the NIACL Administrative Officer (generalists and specialists) Mains Syllabus and Exam Pattern PDF which will enable you to download the file and utilize it even when you are offline and do not have access to a stable internet connection. Furthermore, you can find all this information on the official advertisement which is available on the official website, i.e., www.newindia.co.in. You may require more details pertaining to the NIA AO Recruitment which you will find on our other page. If you have any doubts related to the same, you can comment down below and we will get back to you as soon as possible. The recruitment which was for the posts of Administrative Officer (generalists and specialists) was an amazing opportunity for the candidates from across the country to secure a stable job in a public sector unit of India. If you are one of the applicants who applied for the recruitment, make sure to read till the end of the article which will help you out in preparing for the NIACL Mains examination. So, without further content, we will take you onto the NIACL Mains Syllabus. Before that, just have a look at the NIACL AO Recruitment details. The Main Exam will contain Objective Tests for 200 marks and Descriptive Test will comprise of a total of 30 marks. Both tests will be held online. Descriptive Test will be started immediately after completion of Objective Test. Note: Each candidate will be required to obtain minimum cut off marks for each section of objective test separately for getting shortlisted for the Descriptive test evaluation and for being shortlisted for the Interview. Descriptive Test will be of 30 minutes with 30 marks for testing the candidates’ ability of the English language. Letter Writing will be of 10marks & Essay will be of 20 marks. Note: Descriptive answer script will be checked of only those candidates who qualify the objective test. Depending on various factors like the number of vacancies available, and the number of candidates who wrote the exam, cut-offs will be decided on Descriptive paper evaluation. Marks of the descriptive test will not be calculated in the final grade. This will be only a measure for the candidates to qualify for the stage of the interview. 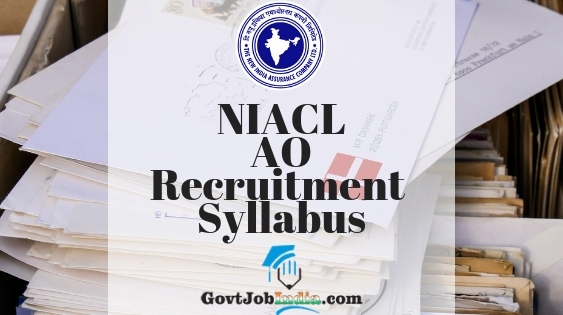 Since the Syllabus hasn’t been mentioned by the organization, candidates can find the speculative portion of the NIACL Recruitment Exam in the sections which will follow. This has been borrowed from the various previous year papers which we have also provided in another article. So, also ensure that you go over to the NIACL AO Mains Previous Year Question Papers page. Prelims Admit Card Release Date: to be declared. In conclusion, we assure you that all the information we have given on this page is according to the official portal. So, in case of any doubts related to NIACL Mains Syllabus, make sure to comment down below and we will clear it out as soon as possible. In the end, we will remind you once again to subscribe to our website @GovtJobIndia.com and bookmark us onto your favorite website for latest updates related to any govt job recruitment in the country.